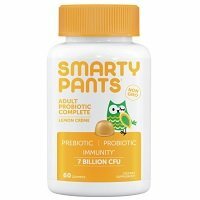 Detailed review of SmartyPants Adult Probiotic Complete. See how this probiotic supplement compares against all the others! I give SmartyPants Adult Probiotic Complete 3 out of 5 stars. There are a handful of things I like and don’t like about this probiotic. Let’s start with what I like. First off, it’s a gummy. It’s hard not to like a probiotic that tastes amazing. This one is lemon crème flavor and they do a great job at morphing a gummy into an adult supplement. It has a creamy, melt in your mouth flavor and texture that isn’t like your typical children’s gummy candy. I really like the taste of it! And it’s super convenient because you don’t have to refrigerate it, no need for water, and you can take it with or without food. Just take 2 per day and you’re good to go! And it was actually hard to stop at just 2! It has 7 billion CFU, which is a great deal more than what I’ve seen in other probiotic gummies. I like that it has 7 billion because most gummies just don’t have anywhere near about CFU to make an impact. It also includes a prebiotic, which helps feed the probiotic and further aids in digestion. This gummy is super allergy friendly and doesn’t use any artificial junk or preservatives, which makes me super happy! It’s also certified vegan from the American Vegetarian Association. So now let’s talk about what I don’t like about this adult gummy. First and foremost, the amount of probiotic strains used is just not enough. Only 2 strains is just NOT diverse enough to give some real results. Especially since I have IBS and need all the help I can get. And even worse, I don’t like the 2 strains used. They’re SBO (soil based organisms), very hardy, and can lead to bad side effects. Personally, I always experience side effects when taking probiotics with SBOs. SBOs aren’t naturally in your gut, but they’re great options for processed foods and supplements because they resist heat and stomach acid. However, they’re aggressive and can take over and overrun other friendly bacteria in their place. I suggest starting with probiotics that are SBO free and work to balance out bacteria levels and secure digestive health. After you’ve tried high quality probiotic blends, then you may venture to SBOs, but always consult a doctor beforehand. It’s also fairly expensive for this probiotics and there’s no guarantee! Overall, I think this is an above average gummy and much better than other probiotic gummies I’ve tried, but compared to a high quality, diverse probiotic, it just misses the mark. In each serving (2 gummies) of SmartyPants Adult Probiotic Complete, there are 7 billion CFU. It comes in 2 strains: Bacillus subtilis DE111 (5 billion CFU) and Bacillus coagulans LactoSpore (2 billion CFU). It also includes Bakers’ Yeast Beta-Glucan Extract, which is a prebiotic that’s intended to act as food for the probiotics. Both of these probiotic strains are spore-forming, soil based organisms or SBOs. This means these microbes aren’t naturally found in your body. In some studies, Bacillus subtilis DE111 has been shown to support immune function, particularly for older adults. It may also help increase enzyme production, which in turn may increase overall digestive health. The second strain used is Bacillus coagulans LactoSpore. This is another type of SBO. Bacillus coagulans LactoSpore may be able to help prevent or treat digestion problems and diarrhea such as diarrhea caused by antibiotics or traveler’s diarrhea. It’s also believed to help boost immune function. Unfortunately, I’m not a fan of either probiotic strains used. That’s because they’re soil-based microbes and not normally present in our gut flora. These particular strains are incredibly hardy and viable under stressful conditions. They can survive heat and processing, which makes them ideal for probiotic gummies and other processed foods or supplements. They also survive our stomach acid. So these strains are aggressive and multiply at an incredibly high rate. That means they can overrun other beneficial bacteria, especially if your bacteria levels are compromised or you have a digestive disorder. These strains may cause bad side effects like belly pain, bloating, and gas. Overall, I don’t like these probiotic strains used and personally always experience these negative side effects when I take them. SmartyPants Adult Probiotic Complete are free of all major allergy concerns. The gummies contain NO gluten, wheat, eggs, peanuts, soy, dairy, yeast, peanuts, tree nut allergens, fish allergens, shellfish, and salicylates. They’re also free of junk and chemicals like: synthetic colors, artificial sweeteners, artificial flavors, artificial preservatives, high fructose corn syrup, and GMOs. The other ingredients include: Organic Cane Sugar, Organic Tapioca Syrup, Pectin, Citric Acid, Corn Starch (non-GMO), Natural Lemon Crème Flavor, Sodium Citrate, Medium Chain Triglycerides From Coconut Oil, Carnauba Wax, and Natural Color Added (Annatto). It costs $32.95 for a bottle of 60 gummies. You take 2 gummies every day and the bottle lasts you 30 days. It winds up being $1.10 per day to take it. That’s really expensive compared to your average probiotic supplement. Anything over a dollar per day is on the higher end. I think it’s a decent price if you specifically want or need a gummy. However, it’s not a good value in general if you’re comparing it to probiotic supplements as a whole. I noticed some bloating and belly pain while taking this probiotic. I have a tendency of seeing side effects when I take probiotic gummies. I believe it’s because they frequently use soil based organisms (SBOs) like Bacillus coagulans. These soil-based strains don’t gel well with my IBS symptoms. So if you have IBS or another stomach ailment, you may want to be cautious with this gummy. I couldn’t find a guarantee from SmartyPants. I’m actually really surprised. I thought they would offer some type of guarantee for their products. Such a bummer! Especially since these gummies are on the pricier end. They do list many online and in store locations to buy their gummies. Such as Amazon.com, Whole Foods, Safeway, CVS Pharmacy, Walmart, Sprouts, Target and Costco. Some of these locations may at least offer a return/refund policy if you don’t like the product. Be sure to check it out before you buy! To buy SmartyPants Adult Probiotic Complete, click here.